Here’s a great letter from Dawn, who’d like some help with translating everyday statements into feeling messages. I thought this process would be helpful for everyone. I feel soft… The sun is hot and the weather is so calm. I was off work yesterday and I completed some pending work and it made me feel light. I feel cold tonight and I’m happy in my blanket. Let me know your thoughts on these. 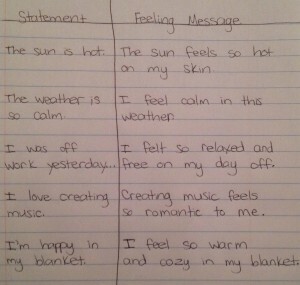 Do you have a process for turning statements into feeling messages? Thanks!! Dawn – these are great! 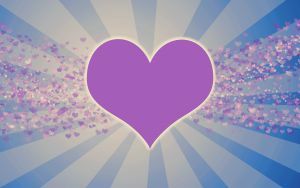 Sharing how you feel using Rori Raye’s tool of feeling messages is a powerful way to build attraction with a man and connect with his heart. 1. 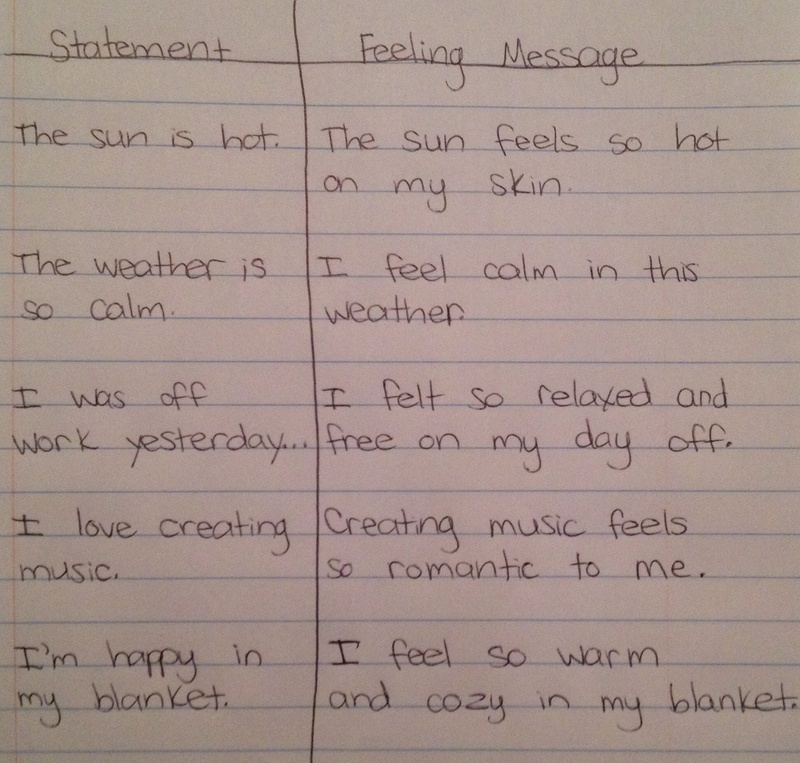 Write down all the statements that don’t have the word “feel” in them on the left side of a piece of paper. 2. Draw a line down the middle of the page. 3. Get in touch with how the statements on the right side of the page FEEL to you. For example, how do you feel when you’re creating music? 4. On the right side of the page, write down some feeling messages that correspond to each statement. Start each statement with the words “I’m feeling…” or “I feel / felt…” (or “__________ feels / felt…” and get in touch with how it feels to YOU). 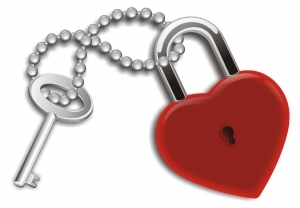 These are just some options – the key is to get in touch with and express how these things feel to YOU. It may not seem like a big change, but using the word “feel” when you’re talking to a man triggers something in his mind (and in yours!) and draws him into you. It turns you from a “reporter” – who just states the facts – into a “poet” – a magnetic, feeling-filled “siren” who’s in touch with herself and mesmerizes men, just by being who she is! Try it next time you’re with a man and see what happens! 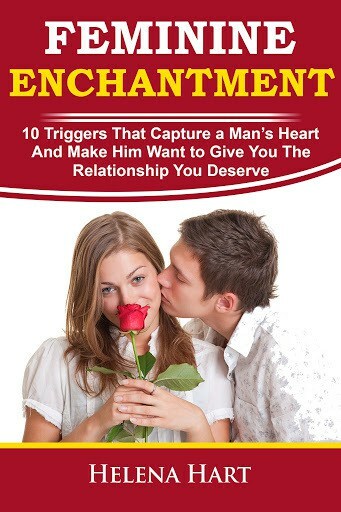 For more free tips on how to connect with a man’s heart and bring him closer than ever, scroll down to download my FREE “3 Keys To Attract The Man You Want” report and in-depth audio training! 8 replies to "Using Feeling Messages To Connect With His Heart"
Wow. I feel touched just by reading them…I would love to try this out. I love the step by step instructions on how to do this, thanks! Love this post, I intend to use even more of your info in the future. Thank you for your posts here on feeling messages. Up until about 5 years ago I have lived my live up with my feelings stuffed in a box of logic. There are lots of reasons for it but the biggest one is it just felt a less messy way to live my life. As a kid, I hated being made fun of for crying at a movie or being told that it did not matter how I “felt” about things in life because life was NOT fair and I would have to get over it. It has been a slow process but after I found Rori Raye’s stuff I realized that there was this whole side of me that was locked up and I needed to get to know and be comfortable with letting become an active part of me. For the past year I have applied a very purposeful effort to paying attention to everything I feel. My soup has been pretty thick at times but I have grown to love my soup because after a good swim my numbness gives way to direction. I made a commitment to myself to allow those feelings to direct me. I desire to be 100% real and authentic and live it out loud. My feelings are so big and my vocabulary feels so small and inadequate to communicate them. I have felt so frustrated in truly giving voice to them. Thanks for your practicle easy to understand articles here. I am going to put them into practice and let the poet in me out. Oh.. and gonna buy a thesaurus too! That’s beautiful! Thanks for sharing your experience with expressing your feelings. I can definitely relate! Don’t worry about getting the words exactly right – just the energy of SEARCHING for what you’re feeling is amazing – and unbelievably attractive! I’ll be sure to write some more blog posts on feeling messages, it’s something I get asked about all the time.